Last week, my kids had a playdate with friends. 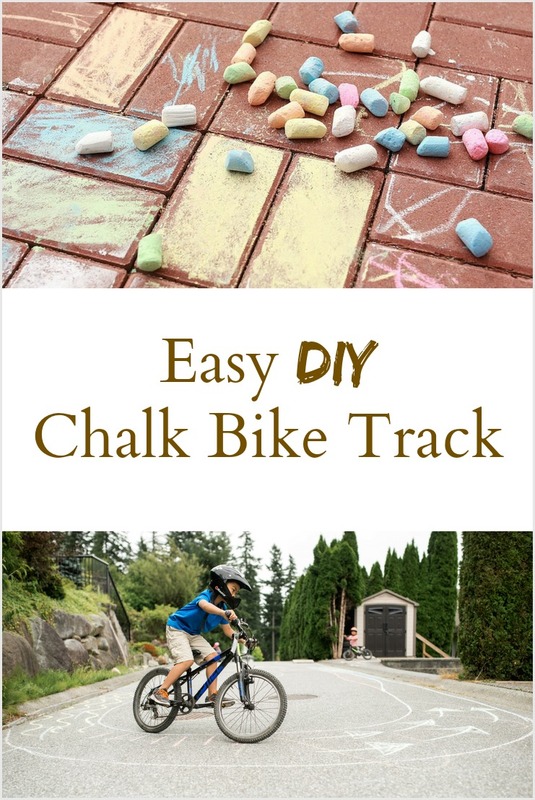 They took their bikes over and were excited to see this awesome DIY Chalk Bike Track when they arrived. Of course I asked her if she would do a guest blog post about it for me. At first she gave me a weird look because really, it was just drawing on the road with chalk! But I told her that is would be so much more, so she agreed, and here is the post! It’s summer. Not just any summer, but the kind of summer after a winter of Winterfell proportions (for us wimpy Vancouverites). So the best way to deal with my children and to be a sane parent, is to kick them outside, and to tell them to ‘have fun, and be safe’. 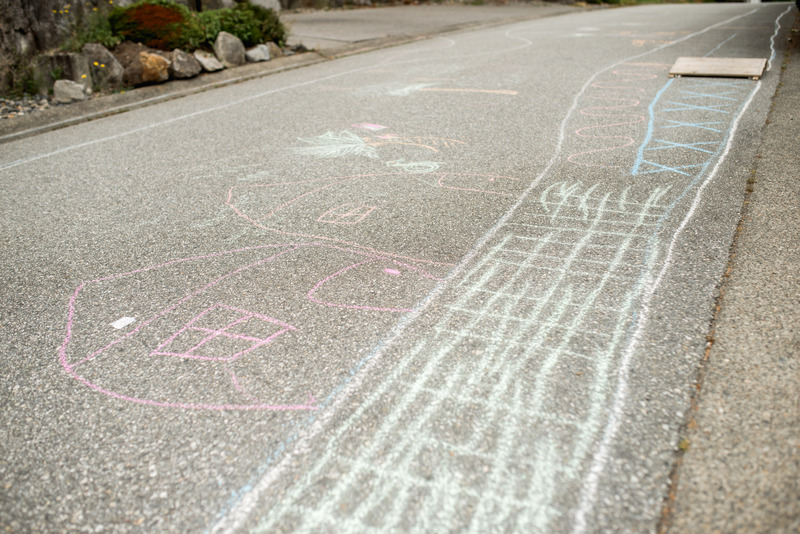 We have an alley behind our house, and when it’s half dry the go-to activity is to draw with chalk. I bought chalk in February with the optimism of a leprechaun riding a unicorn. Safe to say I have a lot of chalk in my garage. Chalk is my friend, because honestly, it’s cheaper than actually going to an ice cream store (cause you can draw it…and use rocks as currency); or easier than…. hauling 3 kids to the playground. The perks of being within toilet and snack range just keep me at home more often than not. It is superior to any indoor art form, because I don’t end up with glue or sticky foam backings strewn all over the floor. So, true to my Instagram name, lazymomsharon, I laze. 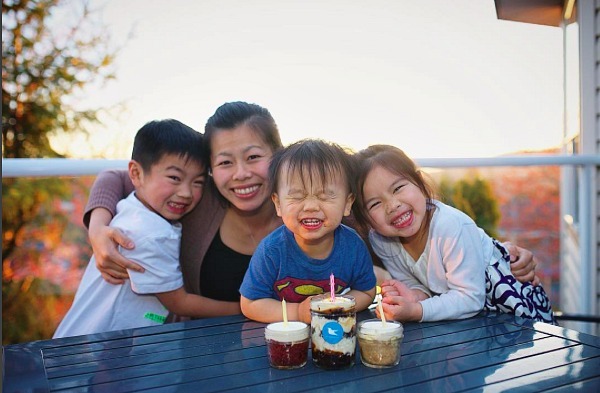 I try to optimize the balance between the effort I am required to exert, and the amount of time I get in return to myself without being interrupted by needy children. As I learned in my Starbucks days, I try to ‘Set myself up for success’. 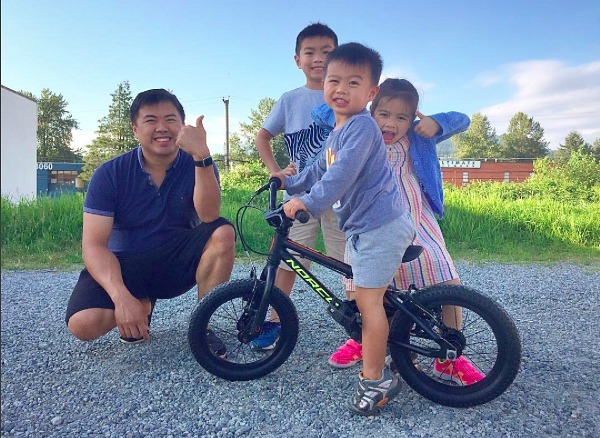 Setting myself up for success in this case meant, making sure 3 kids riding bikes at different speeds and levels, don’t crash, annoy, bump, chase, exercise road rage, and get run over by cars. And this is where the chalk comes in handy. 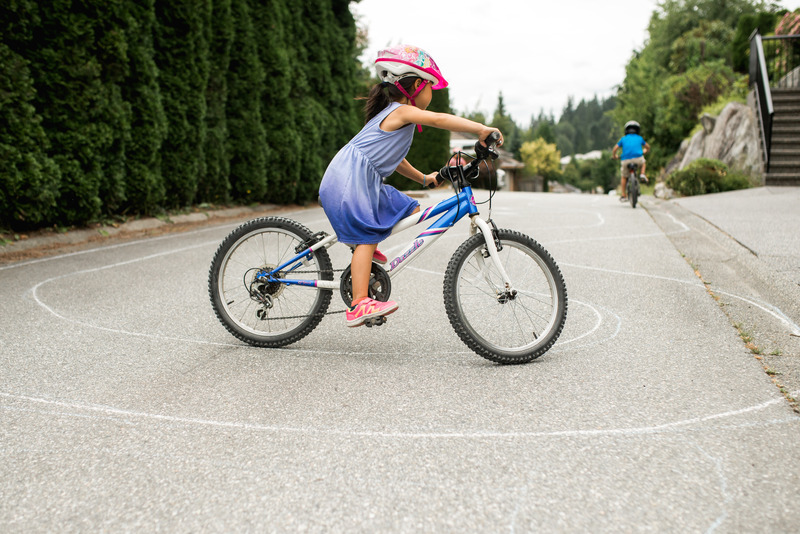 Drawing a huge bike track, to challenge them to stay in the lines, with scenic stops at the ice cream stores, beach, lakes, mountains… (no Picaso, but tell them to use their imagination and you’re golden), is like a real life hamster wheel. The circuit doesn’t end, and they are outside and active. Win-Win. The amount of effort I have to initially invest is chalk and my back (having to bend down to draw it). Maybe 15 minutes of actually making the track – depending on how big or small you want it. Bigger tracks correlate directly to my alone time. Things I make sure I draw are – curves on one side, straightaway on the other for speed, and wide turns at either end. We have some old ramps, which are great for an obstacle in the middle of the course, but honestly you can put anything in there – even sticks and rocks just to learn how to ride over/around them. 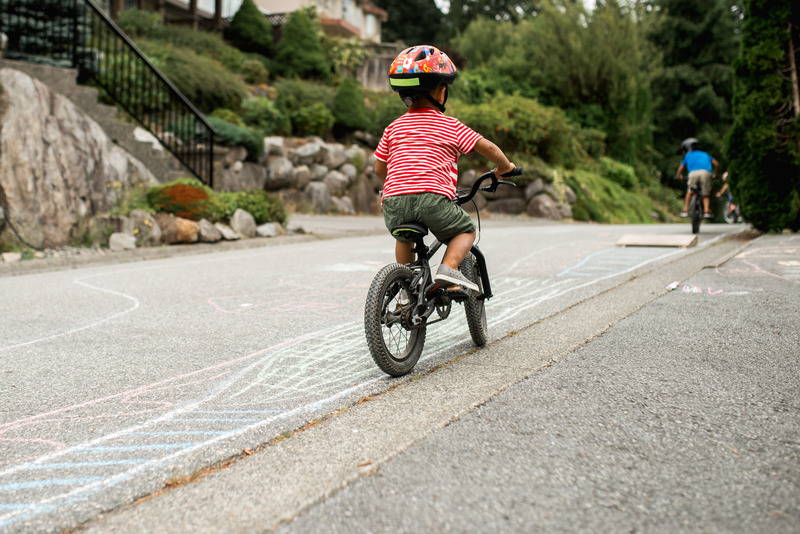 After watching my 3 year old ride it, I also used different coloured chalk (red, yellow, and green) for when to use brakes, slow down, and when to speed up so that I didn’t have to watch/tiger mom style coach him. The kids even made parking spots for themselves, which came in handy for when any car came through! What I do gain for my minimal effort, is independence. Theirs as well as mine. My husband taught all the kids, including our youngest who turned 3 in May, to ride their bikes. Giving them structure will allow them to practice on their own, so they gain confidence for when we are on the trails and there are unknowns. But most of all kids love imagination, pretend reality – so a life size road map peaks their interest. Now, go stock up on that massive pile of chalk for sale at Superstore for $3.77, and enjoy your very independent children with a side of free time. This is really cute, and the neighborhood looks so great for kids!